As a longtime Rush fan (going back to 1981 for me), I never thought Geddy, Alex, and Neil would ever grace the cover of Rolling Stone magazine. Well, my fellow Rushians, I'm here to tell you that's exactly what's happening, starting Tuesday, June 16, at 10 a.m. (ET) (online version), and Friday, June 19 (print edition). Congratulations to Rush on finally ending up where they should have been in, say, 1981 (to Rolling Stone's credit, they did feature the band in a good article in 1981 by David Fricke "Power from the People"). After 41 years together and now in the midst of a likely last tour, the Rolling Stone cover is even sweeter than it might have been in 1981. This is a band that's stayed the course of artistic freedom and showed us all what's possible. They are exemplars of perfection through perseverance -- role models of modesty and graciousness. (When I thought they should reject their Rock and Roll Hall of Fame induction, Rush showed me there was another way. Even after all the bitterness and negativity thrown at them from Rolling Stone and publisher Jan Wenner, they took the high road -- not so much for themselves, but for all of their fans and the musicians who wanted to pay tribute. 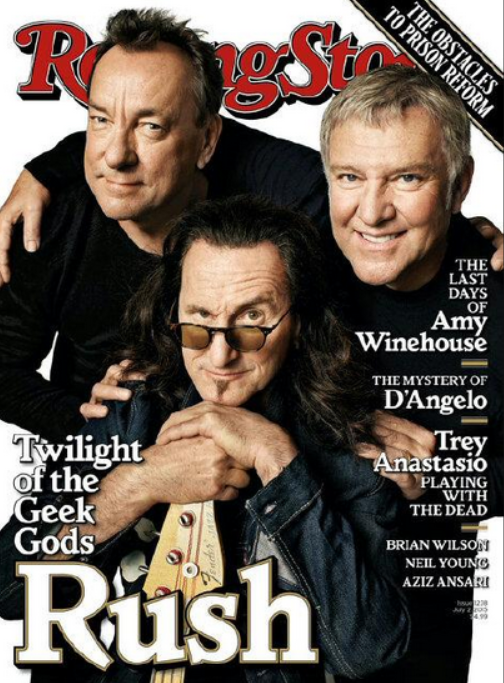 So here they are now, these three Canadian musicians smiling on the cover: Alex's inviting smile, Neil's guarded grin, and Geddy Lee's raised eyebrow. Like Alex's "Blah Blah Blah" speech at the Rock Hall induction ceremony, that raised eyebrow opens up a world of interpretations. At the top of those interpretations, here's one I think is fitting: In this serious, historic moment, Geddy has chosen to reflect on the humorous side of Rush. And why not? Humor is what's kept them together all these years. It could even keep them together for a few more (if Rush fans have their wish).